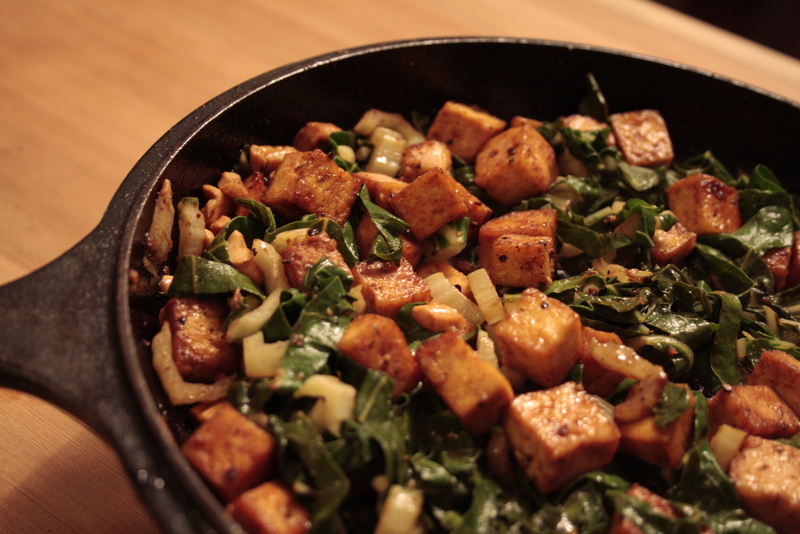 Sticky Ginger Tofu, with Swiss Chard and Cashews | eating with S.O.L.E. 1/2 cup of nuts or seeds. Start by cubing up 1/2 a block of firm tofu (Organic SilverKing Tofu from Nelson is my top pick as always) season cubes with S+P, garlic granules, dried lemon rind, and freshly ground ginger. Brown these in hot vegetable oil and once most of the sides are nice and golden, add 1 tbsp Braggs, and 1 tsp of honey, along with a splash of Asian salad dressing (I make one with balsamic and rice vinegar, garlic, ginger and soy) This older post has a my go to asian dressing recipe on it. Once the honey is in be sure to stir lots so everything gets well coasted and starts getting sticky. Remove from heat and set the tofu aside in a bowl, and de-glaze the pan with 2 tbsp lemon juice and a little pat of butter (or oil for a vegan dish). Now add in the bottom stocks of a swiss chard finely diced along with a small handful of cashew pieces. Salt these and allow them to cook down for 5 minutes, then add the rest of the chard finely diced too along with another splash of Asian dressing, cook for 2-4 minutes. Add your tofu back to the pan along with another hit of zest from fresh ginger and just a drizzle of sesame oil, stir and cover the dish removed from heat. Let set 3 minutes and serve. I was inspired by this and did something similar, but a little different. I prepared the tofu like you did, using a great gluten-free organic store bought spicy szechuan sauce. Then glazed with honey (this was perfect, and gave a nice glaze finish) I used rapini instead of chard, and added red peppers and mushrooms. YUM. Perfectly spicy, and sweet all at the same time. I also enjoy how it offset the bitterness of the rapini. Didnt have any nuts around, but thought it could be good with crushed pistachios. It sounds delicious! I love rapini… i should put that on my seed list for planting this year. I never find it in stores.